Gonio Way | Products Lineup | Products | NIPPON BEARING CO., LTD. The NB GONIO WAY is a curved cross roller SLIDE WAY. It is a curved motion bearing utilizing low-friction, non-recirculating precision rollers. It is used when there is a need to change the gradient or obtain an accurate gradient angle without changing the center of rotation in high-precision optical and measurement equipment. The NB GONIO WAY RVF type consists of curved tracking bases with precisely ground V-grooves and flat installation surfaces, as well as curved roller cages. The NB GONIO WAY RV type consists of curved rails with precisely machined V-grooves and curved roller cages. Precision rollers are employed as the rolling elements, since the rolling elements do not recirculate, the frictional resistance will not vary significantly, providing curved movement with extremely low frictional resistance. 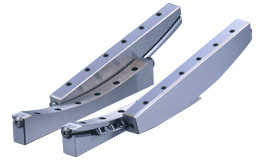 The precision grinding and curved roller cage allow for extremely low frictional resistance. The negligible difference between static and dynamic frictions allows the GONIO WAY to follow minute movements accurately, realizing curved movement of high accuracy. Since NB GONIO WAY employs a non-recirculating design, there is no noise from the circulating area. In addition, the curved roller cage realizes quiet operation without contact noise between the rolling elements. The rollers provide a larger contact area and less elastic deformation compared to the ball elements. Additionally, since the rollers do not recirculate, the effective number of rotating elements is larger, resulting in high rigidity and high load capacity. The flat installation surfaces of the RVF type do not require complicated machining of tables and beds when installing the product. As a result, machining costs can be reduced greatly. The curved V-grooves, which are finished with a precise grinding process, provide an accurate center of rotation. Furthermore, the products are composed to provide identical rotation centers when products of each size are installed to two axes.